This page is dedicated to my daughter Stephanie and her Handling Career. East Coast to the West Coast and to many Nationals over the years. The UKC and AKC have made her official to compete for points a few years ago since then Stephy has taken it very seriously and has become quite a handler. 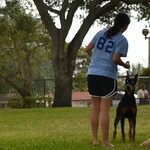 but there you could already see her disposition and enjoyment for handling dogs. Her first real points took place at Wesely Chapel -Fl on March 7th-04 , she competed in UKC for many Junior classes wining and being recognized to compete for the TOP TEN JUNIOR HANDLER AT THE PREMIER on 2005 &2006. UKC Juniors for the moment to help me with our own in UKC &AKC. 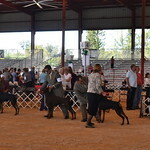 Stephanie has achieved the Champion and Grand Champion Title on several of our dogs here at Buenos Aires. 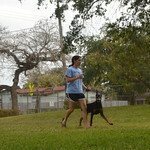 She has also handled some very well recognized dogs all over the country in our breed through the years. 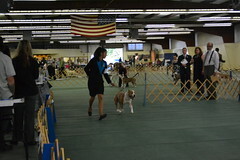 Right now she continues showing in the AKC and UKC wining quite a few Best of Breeds and Multi Breeds best in Show with most of our dogs Stephanie, has started out her show career in both registries with a bang and will continue to succeed as she has the drive to be only the best out there.... and last but not least I have to add that "I am a very Proud Mom"!